Build your base: Lettuce, spinach and kale are all terrific starters. You can make a salad feel heartier by starting with quinoa, wild rice or barley. Dressing: Combine a fat with acid; for example Olive oil & Balsamic vinegar, Lemon juice, mustard & sesame seed oil, etc. 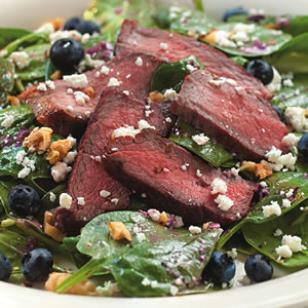 Combine steak, walnuts, blueberries and feta cheese in this simple salad and you have yourself a healthy and satisfying supper.